As security forces continue to search for missing boys, Israelis pour out in hundreds of thousands to prayer rallies nationwide. 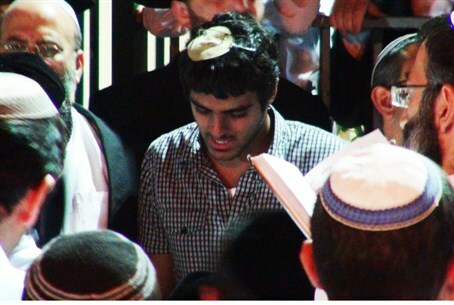 The brother of Eyal Yifrah, one of the Israeli students kidnapped on Thursday night led an emotional prayer service in his hometown of Elad. Yifrah was taking part in of countless prayer rallies taking place nationwide, including one called for just after midnight tonight at the Kotel (Western Wall) in Jerusalem. Mass prayers for the safe return of the boys were held throughout Shabbat amid an outpouring of public sympathy. IDF and other security forces continue to scour the Hevron region where the boys are believed to be being held, but officials are remaining tight-lipped about the progress of the investigation, or indeed how much they know about the circumstances of the kidnappings themselves. Israeli and Jewish activists and supporters have also taken to social media in a show of solidarity under the hashtag #bringbackourboys. Soon after the end of Shabbat on Saturday night, Prime Minister Binyamin Netanyahu confirmed that the students, missing since Thursday night, had been kidnapped by a "terrorist organization". Security forces are preparing for a prolonged search, with one official telling Arutz Sheva they were preparing for "long days and night ahead" in the search for the boys. Former Israel Security Agency head Yuval Diskin said that the kidnappings - and other similar terrorist abductions - were the result of Israel's policy of releasing convicted terrorists in prisoner swaps or as part of negotiations, and called for an end to the practice. Residents of the Gaza Strip took to the streets to celebrate the kidnappings by handing out candy to passersby. Gaza's Islamist rulers Hamas have not claimed responsibility for the abduction, but the group has lauded the "operation" and a spokesperson on Friday called on Arab residents of Judea and Samaria to obstruct the IDF search as much as possible. A damning report claims police in the town of Kiryat Arba, near Hevron, failed to alert the army until more than an hour after they were informed of the abductions, potentially losing valuable time. Netanyahu has moved tomorrow's cabinet meeting from Jerusalem to Tel Aviv, in order to stay close to the IDF's headquarters as he works closely with security officials to track down the boys and their kidnappers. Click here for full coverage of the ongoing search for the missing teens. For translation of the prayer, Psalm 130, click here.